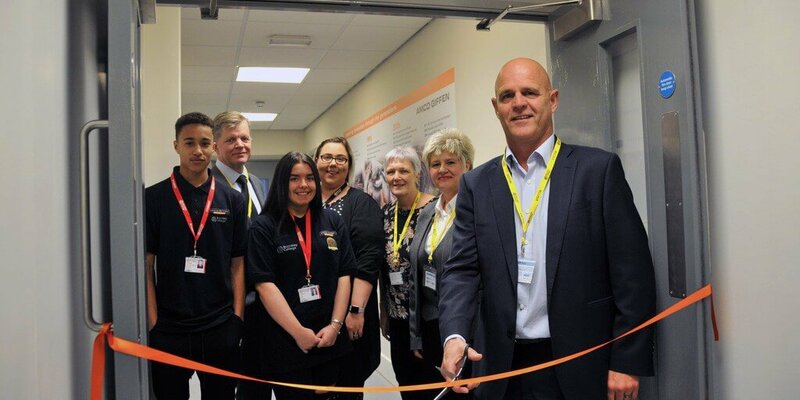 The new AmcoGiffen Academy was officially launched at a special event held at the College’s Science, Technology, Engineering and Maths (STEM) Centre on Old Mill Lane. Guests had the opportunity to find out more about this new partnership between the College and AmcoGiffen, which will provide local young people with the opportunity to develop their skills and knowledge within engineering. The launch event began with a welcome by Chelle Charlesworth, Programme Manager for C-STEM at Barnsley College and Andries Liebenberg, Managing Director at AmcoGiffen. They explained how the partnership will bring education and industry together and how AmcoGiffen and the College will work collectively to tailor the curriculum to develop the skills and knowledge of its students. Andries explained further about the impact the lack of skills is having on the engineering industry, and how this opportunity will help to bridge the skills gap. Students at the Academy will study a Level 1 Engineering course and will be taught by the College’s expert tutors. AmcoGiffen will be actively involved with the Academy by providing industry talks and site visits to the their Head Office in Barugh Green, Barnsley, as well as regularly assessing students and ensuring that they are equipped with the necessary skills to prepare them for employment after they finish their course. Successful students will also have the opportunity to undertake an apprenticeship with AmcoGiffen. After the official ribbon cutting ceremony and tours of the Academy, guests were provided with a demonstration of Microsoft HaloLens, a virtual reality holographic computer software program that AmcoGiffen Academy students will have access to. This software will allow students to engage with digital content and interact with holograms in the world around them. This technology is becoming increasingly popular within the engineering industry and consequently will provide students with further experience of what employers are looking for. For more information about the AmcoGiffen Academy, come along to the Barnsley College Open Day on Saturday 1 December, call us on 01226 216 123, email us or visit the Engineering pages on the website.